Apart from guidelines for ascetics to march forward on the spiritual path, Gita has plenty to offer to each of us in variety of circumstances in our day-to-day life. Though Gita's message was delivered centuries back, it is equally rejuvenating today, which itself is an ample justification for Gita's place among jewel crown of world's spiritual scriptures. Today, Bhagavad Gita has crossed boundaries of cast, creed, religion and nationality and has found place as an icon of human spiritual wisdom. As a result, it has been translated in many leading languages of the world. Gujarati is considered by many literates as 'poor language of rich people'. The language of Mahatma Gandhi was blessed by Shri Yogeshwarji with more than hundred books covering various forms of literature. On premier spiritual scriptures such as Bhagavad Gita, Upanishads, Brahma Sutra, Srimad Bhagavat, Yog Darshan, Ramayan and Mahabharata, Yogeshwarji wrote authoritative treatise in easy to understand Gujarati language. 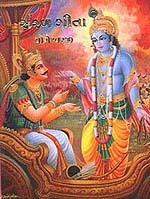 Saral Gita - Poetic rendering of Bhagavad-Gita was written by Shri Yogeshwarji in 1953 and was first published in 1960. Thereafter due to popular demand, it was reprinted many times. To date, more than 150,000 Saral Gita have been published in 27+ reprints. 'Saral Gita' audio cassette is also available in the melodious voice of Ashit & Hema Desai. The only available Gujarati translation of holy Bhagavad Gita, 'SARAL GITA' is made available online for the first time on this site for the benefit of millions of Gujaratis' spread across the globe. We have also included mp3 audio for select chapters for your pleasure. We hope that our esteem visitors will be delighted by this offering.